This Three Cheese Low Carb Breakfast Casserole is low on carbs but full of flavor. 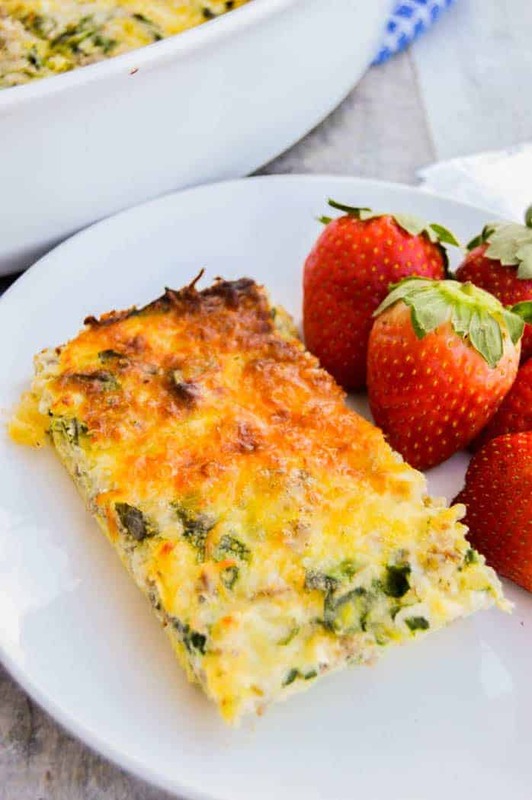 Made with eggs, spinach, and the perfect three cheese blend. I love breakfast food and cheese! 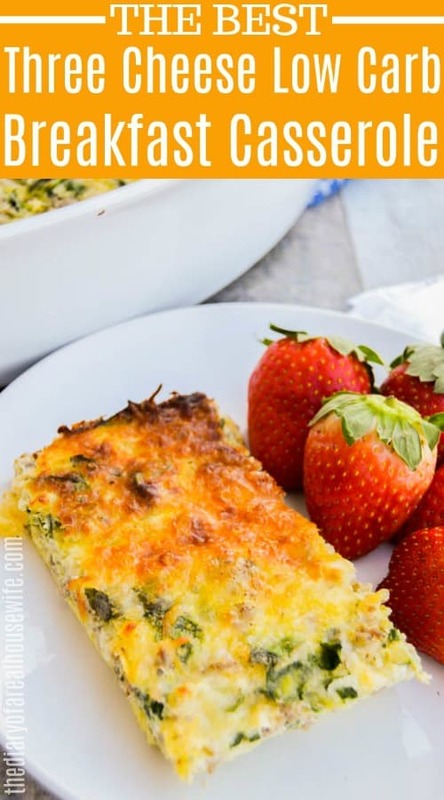 Needless to say, this Three Cheese Low Carb Breakfast Casserole is a favorite of mine and a recipe that you have to try! Plus keep reading for a tip on how to freeze this recipe, and make easy breakfast all week long. Is it breakfast time yet? Time to start cooking, preheat oven to 350 degrees F and prepare a baking dish with non-stick cooking spray and set aside. In a separate bowl whisk eggs with salt and pepper. You can add salt and pepper to taste or none at all, it’s up to you. Ground and cook sausage in a skillet until fully cooked, to make this casserole lower in fat use turkey breakfast ground sausage. Drain the fat from the skillet and then add garlic and onions to the skillet and sauté with sausage for 2 minutes. Place this in your prepared baking dish. Add chopped spinach and 1/4 cup mozzarella, parmesan, and 1/4 provolone. WANNA KNOW A TIP: You can buy a three cheese blend or the Italian cheese blend from the store instead of buying three separate kinds of cheese. Makes it super easy! Now pour egg wash into baking dish and gently mix to make sure eggs are covering the entire dish. Top with remaining mozzarella and provolone cheese and bake for 45 minutes or until a fork can come out clean, and eggs are cooked all the way through. Making breakfast casseroles the night before is the best! You get a wonderful breakfast but don’t have to wake up an earlier to make it. I also love making them into single serving breakfast squares that I can eat all week long. After cooking allow your casserole to cool. Cut it into squares (or whatever shape you like) and place them on a baking sheet. Place in the freezer into each square is frozen. You can now place all the squares into a large freezer bag and they will not stick together. Pull out one at a time for breakfast and warm in a toaster oven or microwave! 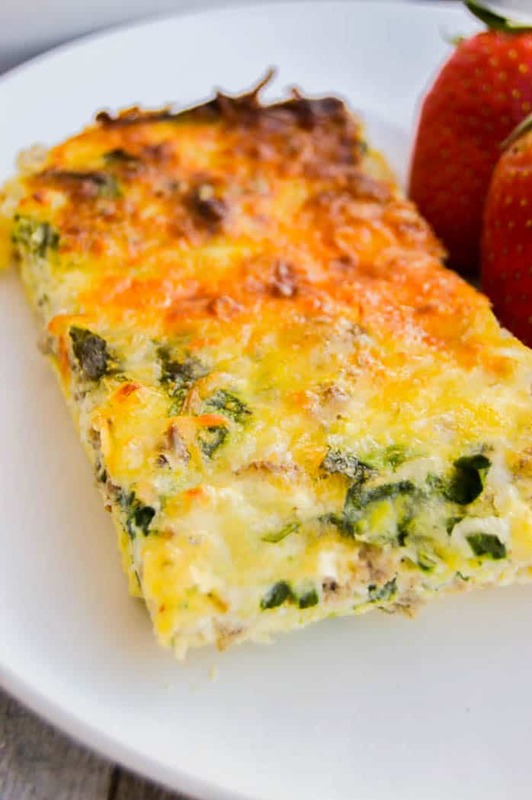 Spinach and Mozzarella Low Carb Breakfast Casserole: I love breakfast casserole and trying new things is my favorite. I love this version, it’s loaded with spinach and lots of melted mozzarella. Bacon Low Carb Breakfast Casserole: If you love bacon you have to try the recipes. It’a loaded with veggies and lots of bacon. Easy Low Carb Breakfast Casserole: This recipe is my classic and go to for a breakfast casserole. It’s simple to make and so full of flavor. Preheat oven to 350 degrees F and prepare a baking dish with non-stick cooking spray and set aside. Ground and cook sausage in a skillet until fully cooked. Add garlic and onions to the skillet and sauté with sausage for 2 minutes. Place this in your prepared baking dish. Add chopped spinach and 1/4 cup mozzarella, parmesan, and 1/4 provolone. In a separate bowl whisk eggs with salt and pepper. Pour egg wash into baking dish and gently mix to make sure eggs are covering the entire dish. Top with remaining mozzarella and provolone cheese and bake for 45 minutes or until a fork can come out clean and eggs are cooked all the way through.